I came across Microsoft rewards when I was researching ways to earn free Starbucks gift cards. I can see a tonne of different gift card options available to me, (including Starbucks!). I originally thought that this was only available to US and Canadian citizens too, but I was wrong! It’s in fact open to many countries so you can give it a go and see what you think. I was pretty excited to check this out, because I like the idea that ou can earn points just by searching the web, which is something I’ve done for several years with Swagbucks. I believed this was the case after reading it on a separate review in the past, so it may be that this used to be the case when it was known as Bing rewards. What is this about & how does it work? Signing up for Microsoft Rewards. Ways to earn, (the daily set, extras & shopping). How much do you need for rewards? Conclusion, is Microsoft Rewards legit & is it worth it? Other ways you can make money. What is Microsoft Rewards & how do does it work? If you just stumbled across this review and actually have no idea what I’m talking about, I will explain for you right now! Microsoft rewards is… as you may have guessed, a way that you can earn rewards online, (such as gift cards). ….But is quite unique to other rewards sites that I looked at before. You can also earn points by taking mini quizzes and participating in polls. It used to be called Bing Rewards and has since changed names to Microsoft rewards. By engaging in these online tasks, you can both earn and save up points and these can eventually be exchanged for rewards, such as for gift cards and more. Each point you save up is worth around $0.001 – however, each time you search the web via bing, you earn 3 points, (that is, at level 1 which I will explain in a moment!). So, you can see by that alone that the points could add up, if you’re someone that frequently searches online and uses the internet. However, if you typically use another search engline like Google, then you’d have to make the switch for it to be worth it. Although, I do use the Swagbucks search feature via their Google extension to earn rewards and the thing with that is, you don’t ALWAYS get Swagbucks for your searches, it’s like a lottery. 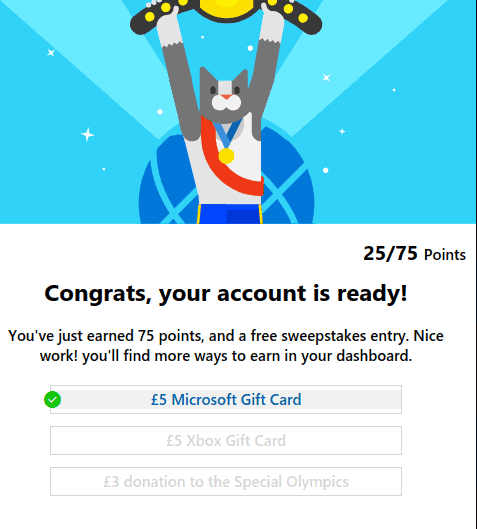 Seeing as you get points every single time with Microsoft rewards, perhaps this is something I could switch to for a while instead and see how it goes. There are two different levels at which you can earn points. At Level 1 – each search is worth 3 points on Bing. You can only earn a max of 180 points per day at this stage. At Level 2 – when you reach 500 points in a single month, you get boosted up to level 2. You can then earn 250 points per day, instead of the 180 daily points at level 1. Increased points made when you spend on the Microsoft store, 1:1 – to 10:1. If you haven’t already, you’ll need to sign up for a Microsoft account – don’t worry, it’s free to do this. I hadn’t realised, but I discovered I already had a Microsoft account which I’d forgotten about. They walk you through the next steps, as you sign up here! They give you the opportunity to earn 75 points right away, but asking a few simple questions. At the end of the initial 75 point section, you can set a goal. (I’m in the UK, but it will correlate to your own countries currency). Don’t worry if you’re not sure about setting a goal, you can change it whenever you like and you’re not stuck with it! So, the main way that you’re probably going to be earning points on a daily basis, is via searching on Bing as your primary search engine. However, don’t just try and sit there all day searching for random stuff that’s meaningless, you can actually get banned from Microsoft rewards from doing this! As I said earlier, you can get up to 180 points a day and 3 points per search at level one…. I’m in the UK and these are the rules for me, I have seen other people from the US saying they get 5 points per search and 150 points at level one!? I’m not sure if perhaps the numbers change depending on location – OR – if they’ve changed recently for all. In any case, there isn’t too much difference and you’ll see as you go along the specifics of the numbers and everything else. The thing is, it’s free and it’s LOW effort. As far as the search feature goes, you’re not doing anything aside from specifically going to Bing rather than Google, (or whatever search engine you usually use!). Each day there are three new activities you can do here to earn points. A request to look at a set of photos on bing, for 10 points. When I clicked on the first task it just took me directly to a search results page… that was it, all I had to do! Most of the quiz related tasks involve the search engine results – but it’s all super easy, QUICK and quite enjoyable! A super quick quiz, I had to answer 3 questions for 30 points. It didn’t matter if I got it wrong, I could just repeat them until I got them right. A daily poll… Simply a question where you pick your preference, for another 10 points. If you login to the daily set three days in a row and complete the new set of three tasks, you will get a 45 point bonus. It doesn’t stop there though, if you continue to login every day, your streak rewards go up higher. 3 day streak = 45 points. 5 day streak = 75 points. Another +7 days = 105 points. Another + 7 days = 105 points. An extra +10 days = 150 points. An extra +10 days after that = 150 points. But as soon as you don’t login for one day, you will lose the streak and start from the beginning once again. When I scrolled down below the new daily set of tasks, there were many more tasks I could do too. After scrolling by the daily set, there were more tasks to do, (you can see a selection in the image above). Some of these easy tasks simply involved clicking on a link, entering a sweepstake for a prize, (in my case, a laptop!) or taking a mini quiz. What I really love so far about Microsoft rewards is how EASY the tasks are to complete. No long drawn out surveys that you’re unsure will ever end… just short and snappy questions and tasks that are actually fun rather than tiresome. Also, you don’t have to do any of these extra activities to keep your streak going, but it’s just a way of making extra points. Another way you can quickly rack up points here is by making purchases on the Microsoft store. You can actually earn… TEN yes … TEN points per every dollar, (OR pound) at level 2, plus you can earn bonus points. You can also earn additional points on the Xbox store too and even up to 20 points per dollar/pounds – if you’re a level 2 member with Xbox Live Gold. There is absolutely NO reason to go to any of this effort at all, if you have no interest in the rewards on offer. In this case and what I’ve seen so far, there is a good variation of rewards on offer. The rewards available are going to vary slightly depending on your location in the world – but in any case, there are a nice selection of gift cards and even some sweepstakes you can enter. If you need thousands and thousands of points just to redeem a miniscule reward, it may not seem worthwhile and worth bothering with? Well, the bad news is, you kinda do need thousands of points for rewards. How much gift cards are, depend on what currency you’re withdrawing in. If you’re withdrawing in dollars you need at least 5250 for a $5 gift card and how much you need varies on the gift card. If you made 50 points a day, it would take 105 days to make a $5 gift card. But if you make 200 points per day, (which is more than easy to do if you’re doing the daily set, get the streaks and use Bing as a search engine) it would only take around 26 days. If you’re in the UK, you will need to accumulate more points, as a £5 gift card starts at 7500 points. Another downside I noticed, is that you can only withdraw in these small amounts – you can’t get a $20, $50 or $100 gift card. When you check out al the different ways you can earn points and think you’d make some effort daily…. I don’t think it’s unreasonable to think you could easily make a $5/£5 gift card each month. If you put a bit more work into that, up to $10/£10 is possible but less realistic for most people. Is it worth it for such a small amount? Well, it doesn’t really take up much time in the way that completing paid surveys can do. Yes, you could make more doing paid surveys if you’re careful with your time and do a few a day, but Microsoft rewards give you points for doing really simple acts, like searching the web. I’m told the gift card options are subject to change – but there is a really decent amount. I love that they have gift cards for stores like Tesco & M&S, (where I do a lot of food shopping) but it’s a bit frustrating that you can only withdraw in £5 increments?! There are a couple of $10 ones in the US… perhaps this will change in time! As well as saving up for gift cards, you can also use points towards sweepstakes entries and little instant wins. One that I tried was called, flip and win. It cost me 100 points and you see if you win instantly. There are a bunch of different prizes to be won at any time, including xbox bundles. Unfortunately…. I didn’t win this time. As there is likely to be an extremely slim chance of winning any of these prizes, saving up for gift cards is a sure way that you actually will be rewarded for your effort. If you’re feeling charitable and don’t really want to get a gift card, or enter a sweepstakes – then you may want to donate your points to charity instead. Most of the donate options are for 1000 points and will equal $1/£1 to your chosen charity. Microsoft Rewards Tips – Maximise Your Earning Potential! You don’t have to just search to earn points. If you go and check out Bings main page – you’ll se a bunch of news articles there ready to read. By CLICKING on these, you can also get points. If you’re someone who likes to keep up to date with the news, then this is something you’d most likely want to do anyway! Don’t just click everything on the homepage and immediately move on though – again, this could potentially lead to you getting banned. However, it’s a good way to earn points, without actually having to physically type anything at all into BING. Having had a peek myself, there were some interesting stories that I wanted to check out. When you log into Microsoft rewards, there is a little tick box option where you can opt to stay signed in. Because, if you’re not logged in, you’re not going to receive any points at all… simples! If you’re logged in, you should see your name AND how many points you have, in the far top left of your screen when you’re on the Bing homepage. You can also accumulate points on your mobile and with so many of us using our mobiles most of the time, you could be missing out on tonnes of points if you don’t! You can simply use Bing on your mobile – or you might want to download the Microsoft Edge Android App, which will make searching easy, while also getting you some extra additional points! I had no idea that you could rent movies via Microsoft too. As you get 10 points per dollar, it could be an easy way of getting some additional points, (that is, if you usually rent movies – no point doing it JUST for the points!). It also pays to download games with Microsoft and as these games can be super expensive, it would also be a way of you bagging lots of points. 10 points per dollar could really add up here. Joining Swagbucks is free and as well as getting points for your Microsoft purchases, you can ALSO earn Swagbucks and start earning rewards on there as well. I’ve saved a lot of money via useing this platform and have also managed to redeem many gift cards in various quantities. If you download their chrome browser extension, they notify you any time you go on a website where they can give you cashback. Sign up here and you’ll also get a $5 sign up bonus, (or £3 in the UK). This is optional, but you’re able to set goals on your dashboard, in order to aim towards a particular rewards. So, if you fancied getting an xbox gift card, for example, you can set this as a goal and see just how many points you still need to earn at any time. As I mentioned further up, I have set my goal to a Starbucks voucher, just because I’ve been trying to save money while working there during the day. Microsoft rewards will sometimes send you out special offers via email. This could involve you getting extra points, or being able to enter a competition for free! If you don’t want to miss out on potential freebies, be sure to open any emails from Microsoft Rewards. Earn points doing things you would already be interested in doing, (surfing the web, buying games, reading the news…). It would be good to have some tasks that gave you HUNDREDS of points and tasks that didn’t involve purchasing something. Conclusion – is Microsoft Rewards Legit? I’m sorry I waited so long to discover this one, it slipped through the net. But now I am going to make a sustained effort and will update this post when I have my first gift card. It’s just a shame that you can’t make more points with this and some higher value gift cards. But I do like how simpe it is and how short and easy the questions tasks and polls are. This is really low-effort… Yes, it’s low-reward too, but it is free and I have found it enjoyable so far. If you’re going to be searching the web anyway, you may as well earn rewards for it and the other mini tasks are really quick. Do you have any thoughts you’d like to share about Microsoft Rewards? Beyond An Extra $5-$10 A Month, Making More Online! You may be thinking to yourself…. $5 a MONTH!!!?? That’s not going to help pay the bills! Nope, these sort of extra income websites are really pocket money, (in the best case scenario!). If you want to earn hundreds, or even thousands of extra dollars a month – building your OWN website is a good way to go long-term! Sound complicated? It’s easier than it sounds.